Manhood for Amateurs: The Pleasures and Regrets of a Husband, Father, and Son. More than just very satisfying, it is probably essential to have a good book to read in the hiatus between Christmas and New Year and even a little beyond, before we go back to our normal lives working or studying. Something that we can reflect upon while doing those other necessary things. At year’s end I read the latest Peter Corris crime fiction, Torn Apart and a nonfiction by PD James, Talking About Crime Fiction, which didn’t teach me anything I didn’t already know about this particular genre and did not compare at all favourably with Kate Summerscale’s wonderful nonfiction, The Suspicions of Mr Whicher (which I have also reviewed), that also gives us a history of the detective novel. But then I picked up something completely different in Michael Chabon’s Manhood for Amateurs: The Pleasures and Regrets of a Husband, Father, and Son, and was immediately charmed by the wisdom, the wit and the lucid writing style employed to display these qualities. 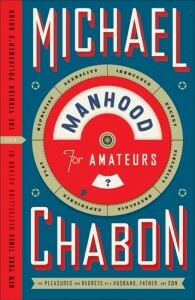 Manhood for Amateurs is a memoir of the masculine roles Chabon has played and continues to play in his life. It is offered as a series of essays – 39 of them – featuring many of the nagging little worries we have all experienced – men and women – in our own roles as children, spouses and parents. The essays are divided into ten parts which have words like Techniques, Strategies, Exercises, Styles, Elements, Patterns, Studies, Elements, and Tactics in their headings, but feature completely personal and therefore identifiable conundrums which most of us have stumbled over but probably did not have the time to analyse as we struggled to get back on our feet. That’s why this book is so valuable. It is a kind of navigation marker to our own lives and attempts as parents, lovers, dutiful sons and daughters. In his second essay, entitled “William and I”, Chabon comments on a comment made to him by a woman wearing rainbow leggings at the checkout counter of his local store, where he was unloading groceries with one arm and holding his twenty-month-old son in the other. The woman told him that she could tell that he was a good father. In “The Wilderness of Childhood” Chabon compares the freedom he experienced exploring nature and having all sorts of adventures unsupervised by adults, with the lives of children today. He worries that today’s kids cannot even be allowed to be bored in a later essay, and in another, about how they are bombarded with crap, from television, movies, and the popular culture in general. Even Lego is looked at suspiciously, since it has moved from basic colours and shapes that required no elaborate construction maps, to irregular polygons, hybrid pieces and “minifigs”, those Lego people who could be monsters, Vikings, American Indians, Jedi knights, pizza chefs or characters from the Harry Potter saga. But there are lots of delightful considerations amongst the angst: the perfect father-in-law who accepted him so completely into the family when he married his first wife, that he is haunted by the man’s goodness and what would appear as his own betrayal of him when the couple divorced; his pleasure in making cakes for his subsequent family; the observance of valuable rites of passage through childhoods and ultimately whole lives; the patterns in family cohabitation that recur and consolidate its worth. Chabon’s sensitive examination of manhood is a revelation to this reader and mother. Perhaps the Dolly the Sheep experiment was not so appalling after all. Maybe if such men as this Pulitzer-Prize-winning-author were cloned as husbands and fathers for many women, the human race would be a much safer and happier proposition. But that’s still in the realm of fantasy. Just read the book and enjoy it as I did. Something positive is sure to rub off on all of us.